Chrysoberyl is the name of a mineral as well as three different gem varieties--two of which are widely accepted as some of the most rare and valuable of all phenomenal gems. The gem commonly known as chrysoberyl is a yellowish-green, brownish-yellow, or colorless transparent to translucent mineral that is usually faceted into gems and generally considered a collector's stone. While not often set in jewelry, its characteristics make it ideal for such use. When chrysoberyl displays color-change properties, it is known as alexandrite, and when it exhibits chatoyancy, it is known as cat's eye chrysoberyl. refractive index, birefringence, pleochroism and spectrum. Spectrum should reflect a strong diagnostic band at 444nm. Phenomenal chrysoberyl may exhibit chatoyancy, in which case it is classified as "cat's-eye chrysoberyl." Misnomer: oriental chrysolite. 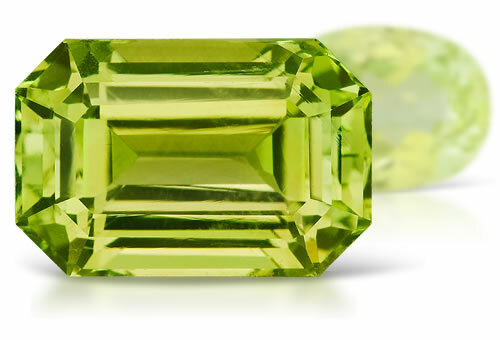 Transparent green and yellow chrysoberyl are type I clarity stones. Stones might show twinning planes, feathers, fingerprints, silk, elongated tubes and needles.